Mark McGwire speaks out against steroids, and we at the Taylor Hooton Foundation are very proud of Mark and the message that he is sending to kids and other ball players! 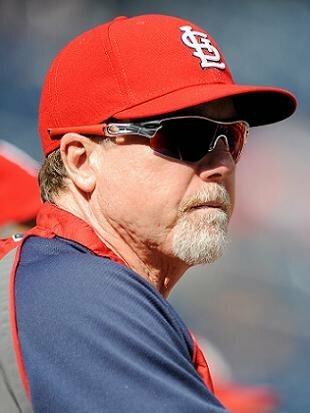 Nearly three years removed from his interview with Bob Costas where he admitted using steroids during his playing career, former St. Louis Cardinals slugger and new Los Angeles Dodgers hitting coach Mark McGwire is now adamantly advising current and future baseball players who may already be altering their bodies and performance with PEDS, or are considering doing so, to “use your head” and “run away from it”. McGwire made the comments during a recent interview with Fox Sports Radio. The folks over at Sports Radio Interviews later posted the full transcript which you can read here. Say what you will about McGwire’s past - everybody has and will continue to do so - but you have to give him credit for not only coming clean, but again making it a point to denounce his actions. As Mark Whicker of the Orange County Register pointed out, by doing so McGwire continues to rehab his reputation and credibility, and in the process has reinvented himself as a teacher and mentor within the game. Something he’s done well enough that the Dodgers targeted him to fill their hitting coach vacancy and the Cardinals didn’t want to lose him. That’s not to mention that fact that his message will be heard, and in many cases will be heeded by those listening, which is really all that matters. And sure, the McGwire family may have benefited financially from his choices, but in many cases it’s true that money doesn’t buy happiness, and it’s clear McGwire was not a happy person during that time in his life. Now that it’s out in the open, he has a credible voice on the topic and he’s fully involved in the game he loves, it’s turning in to a good thing for many different people.